UNIK-4 MULTIFUNCTION is designed for those who wish to own an entire physiotherapy center in one unit designed and engineered to treat and solve all those diseases that currently require the use of varied and expensive machinery. Destined to become the new multipurpose support, which is essential as a reference point for all those who intend to use the Physical Therapy at the professional level in any place where it is required the assistance of a qualified and specialized. 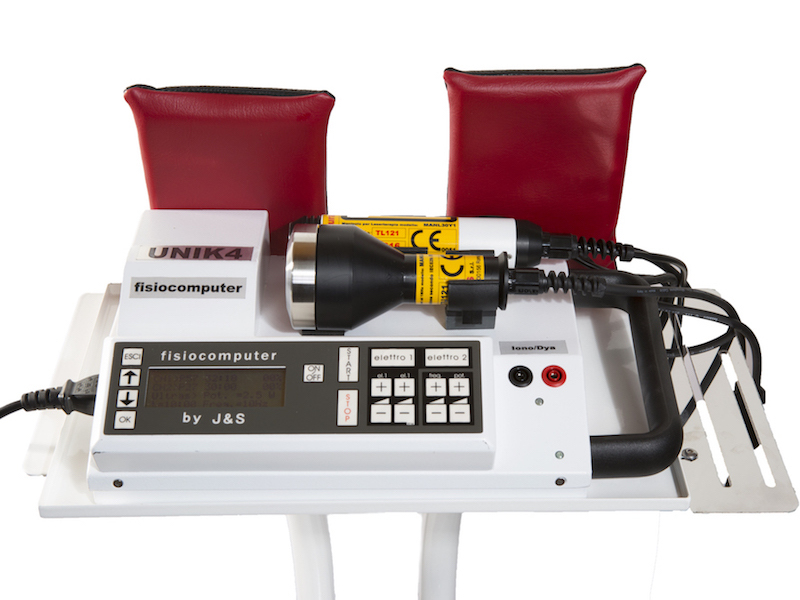 The UNIK-4 multifunction offers a range of programs specifically tailored to each individual need that pain relief, rehabilitation or preparazione. This new frontier of technological innovation applied to the Physical Medicine allows the user to choose between four distinct units contained in UNIK-4 : Magneto , laser therapy , ultrasound therapy , electrotherapy , the latter with separate outputs : two for the stimulation pulse and one for iontophoresis , iontophoresis , Dyadinamiche. The UNIK -4 multifunction is a device created by the clever combination of the latest technologies available today and the latest findings of Medicine Applied Physics, designed exclusively for the body to restore physical fitness and well-being that only a high quality of life can give. For example, you can run at the same time electrotherapy , then TWO INDEPENDENT CHANNELS (then TENS stimulation and together), and the Laser, all at the same time. The UNIK-4 multifunction, as it has been conceived and with the new standards that imposes, is rightly as the compact for Physical Therapy of the new millennium. Like any medical device manufactured by J&S also the “fisiocomputer UNIK -4 multifunction” has a number of preset protocols specifically for various diseases to be treated, FOR EACH OF THE 4 TYPES OF APPARATUS AND COMPOUND.